Born in 1969 in Beit Eddine, Lebanon. He graduated in sculpture and has Masters in Visual Art from the Lebanese Academy of Fine arts ALBA and a specialization in sculpture and in virtual sculpture from the “Ecole Nationale Supérieure d'Art de Cergy” ENSAC, France. From 1995 till 2000, he was a teacher of sculpture at the Lebanese Academy of Fine Arts ALBA. He holds numerous awards for his work in international competitions and biennial, and also creator of several trophies of festivals. To his credit several solo and group exhibitions, and symposiums in Lebanon, France, UAE, Syria, Canada, Morocco and China. 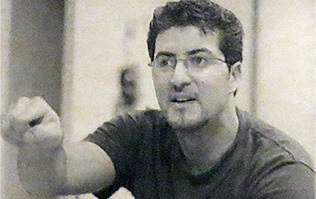 He has many monumental works distributed in public places in Lebanon and abroad. His latest solo exhibition was held in 2014 at Al Bustan International Festival of Music and the Arts, Lebanon.